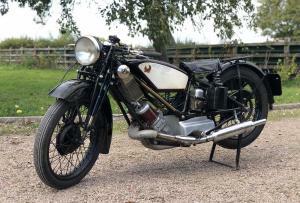 Scott Flying Squirrel Registered On 18 th Of September 1930 ; So ‘ Vintage ‘ And Banbury Run Eligible. This Is The Rare ‘ Short Stroke ‘ 500 cc Model , Which Has The ‘ TT Forks ; Like The ‘ TT ‘ Model , With The ‘ Longer ‘ 1st Gear ; Good For Say 45 mph And Closer Gear Ratio’s. 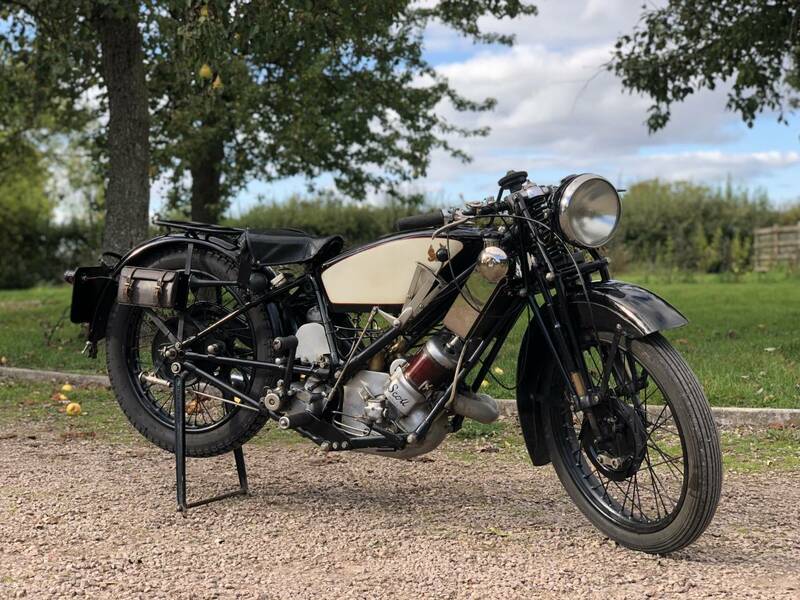 This Example Is Very Original , With Original frame ; Engine ; Gearbox ; Mag ; Dyno ; Oil Pump ; Carb ; Forks ; Radiator ; Mudguards ; Wheels ; Etc , etc ..It Also Retains It’s Very Valuable ; £4000 ! Original , Transferrable Registration Number . Once You Get ‘ The knack ‘ It’s Very Easy To kick Over And Starts First Kick And Sounds And Smells Lovely Too ! It’s Very Easy To Manoeuvre And Ride , As Feels Small , Low And Compact , With A Low Seat Height And Low-Down Centre Of Gravity. This Is A Relatively Quick Accelerating Vintage Machine , Which Can Easily ‘ Cruise Along At The National Speed Limits , So Has No ‘ Holding Up The Traffic ‘ Issues ! So , All In All , A Lovely ‘ Vintage ‘ Very Useable , Easy To Live With , Rare Example , Of ‘ The Scott Marque ‘ That’s Proved To Be Very Reliable And Ready To Ride Away. Previously Owned By The Late , Brian Verrall ; The Most Respected UK Dealer Who Was Renowned For Selling Some Of The Best Classic Machines In The UK . 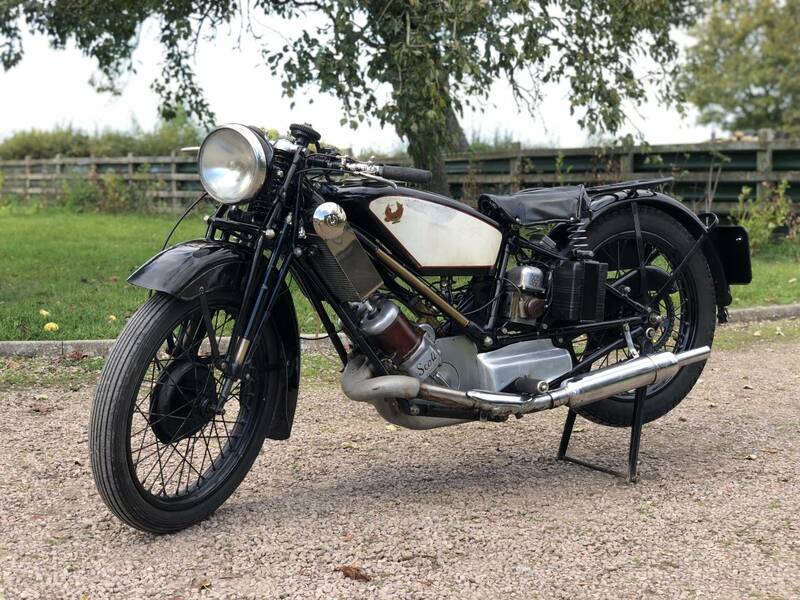 So This Examples ‘ A Goodun ‘ And Will Prove To Be A Great Investment And A Great Addition To Any Serious Motorcycle Collection And Good Fun To Ride Too !